Review: The Tainted City by Courtney Schafer – King of the Nerds!!! Courtney Schafer’s debut novel The Whitefire Crossing was one of the pleasant surprises of 2011. A character driven fantasy tale in an original setting it ending with a satisfying conclusion that left our heroes alive but not necessarily in the best of circumstances. Fast forward to 2012’s release of The Tainted City and we return to see the climber Dev forced to work in the mines of Alathia to pay off his crimes for participating in Kiran’s blood magic. Kiran, his magic is bound by the Alathian Council, struggles through his own captivity doing his level best to try and convince his captors that he is truly a changed man. However, Kiran’s master Ruslan is not so easily thwarted and the warded country of Alathia finds its wards under attack by vast magical forces. It isn’t long before Dev and Kiran are reunited and press ganged into aiding an Alathian mission to Ninavel tasked with uncovering the nature and source of these magical attack. Much as in The Whitefire Crossing the characters of Dev and Kiran mirror one another at the outset of The Tainted City. Kiran is bound from practicing magic while Dev is not allowed the scale the mountains the taunt him on the horizon. Kiran’s love of magic and Dev’s love of climbing, their passion for their respective arts, is what binds them together. Schafer does a wonderful job in capturing the way in which their respective captivities really hobbles each of them in turn. In many ways they are both less than complete without the ability to follow their passion. Once they are reunited together in many ways they each recognize that same loss in each other and the bond between forged between the two characters really comes to the forefront. Bonds, both Kiran and Devs and others, play a central role in the novel. Moreso than the adventure laden previous novel The Tainted City focuses strongly on relationships and the way the connections between different people can drive the world it various directions. On the one hand you have the bonds Kiran has formed with Ruslan, Mikail and Lizaveta these are bonds with an emotional presence and tangible magical presence. There are the bonds Dev has forged with those in his past life and his promise to save his (decseased) best friend’s daughter. There are bonds between the members of the Althasian group that play important roles in the plot. Schafer has woven an intricate web of relationships among these characters and done so with such elegance and grace that it never once feels forced, it never once grows confusing, and you constantly find yourself fascinating even by the most despicable of characters. 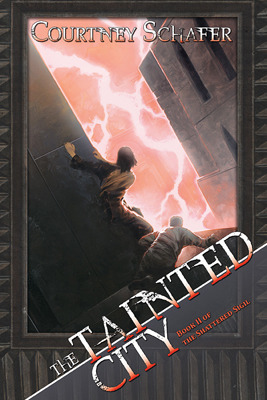 There is certainly less adventure in The Tainted City than in the previous book I didn’t really miss it. The tensions caused by the various relationships in the novel and their interactions with one another more are as exciting and engaging as anything The Whitefire Crossing; in truth I found The Tainted City’s plot more engaging as a result. As she did in The Whitefire Crossing, Schafer once again shows an impressive ability at crafting a satisfying conclusion that somehow manages to further complicate the lives of our heroes. You’ll also note that I’ve deliberately avoiding talking about the plot too much. There are some interesting twists, particularly involving Kiran, that I don’t want to reveal for potential readers. I will say that novel takes a little while to get a full head of steam but by the time the characters have hit Ninavel things accelerate quite rapidly with new twists and turn coming with increasingly frequency as the novel ramps up for its conclusion. The Tainted City takes everything I love about The Whitefire Crossing, particularly in terms of characterization, and turns it up a notch creating a tense, emotional novel that with only some relatively minor pacing problems was an absolute joy to read. With her subtle worldbuilding and unique setting Courtney Schafer is definitely an author that deserves your attention, particularly if you enjoy character driven fantasy. I’ll definitely on board when the next volume of the Shattered Sigil series releases.